This past week or so has been a whirlwind, and though I’ve baked all sorts of delicious goodies (sooo many cookies! ), I’ve neglected to provide you with any evidence. I turned twenty eight years old at the beginning of the week, and we celebrated with a fancy dinner out, and a surprise ice skating date. Watching my big, tall husband, who had never ice skated before, slowly and awkwardly making his way around the rink, gripping the rail with every step as elementary school kids lapped him, and falling more than once in front of the crowd, cemented all the love in the world that I have for my wonderful man. Side note: this was also the first time ever, that I’ve out-performed him in any activity even remotely athletic. The rest of the week is a blur of flour, butter and sugar. Until Thursday. I was getting ready for a black-tie holiday ball for my Honey’s office, running terribly late with the hair and nail and makeup efforts that I always think will take less time than they do, when my mom called. Instantly, from the tone for her voice, I knew something was wrong. Oliver, my childhood dog, our fourteen year old, black English labrador retriever, our barrel chested, broad-faced, happy pup, had taken a downturn. Nearly blinded by cataracts, and partially (and often selectively) deaf, Ollie had been geriatric for several years, moving slowly due to age and some arthritis in his back legs. Despite being approximately 117 in dog years, and on a daily regimen of vitamins and medicines, he was happy. Happy to go on his daily neighborhood walks, happy to play with his toys and bark at the deer, and always, in typical lab fashion, happy to eat. But in the last week, he had stopped eating. He could not longer get in and out of his crate, or very well stand up. He seemed disoriented, barking and growling upon being touched, as his body failed him. Arrangements with the vet had been made. I remembered, a decade and a half ago, in the throes of my gangly, awkward adolescence, picking out our sweet little lab puppy, the puppy we had begged for, bringing him home on the way back from Thanksgiving. He shared a birthday with my brother, and the breeder promised us a calm, submissive, mild-mannered pup. Instead, we brought home an oft wild dog, with a penchant for string cheese and avocado foraging, who spent half his life as a teenage version of Marley. We fell hard for that crazy, happy, knuckle-headed, sweet dog. He became a member of the family (though didn’t always sit still long enough for Christmas cards), and I already miss him. I needed to fill the house with warming spices, the sort that remind me of home, of my parent’s kitchen around the holidays. Of Ollie’s domain. We still had that party, so I wiped my eyes, reapplied makeup, stepped into my new gown and put a smile on my face. But the next morning, I set about creating a new gingerbread recipe, packed with cinnamon, ginger and cloves, the sort of heavenly, holiday spices sure to help bolster my spirits. Something about the process of baking, my apron dusted with flour, always seems to cheer me up. Maybe it helps to fill a little bit of that void. At the very least, it’s hard to accurately measure baking ingredients while teary, so maybe the process is just a good distraction. 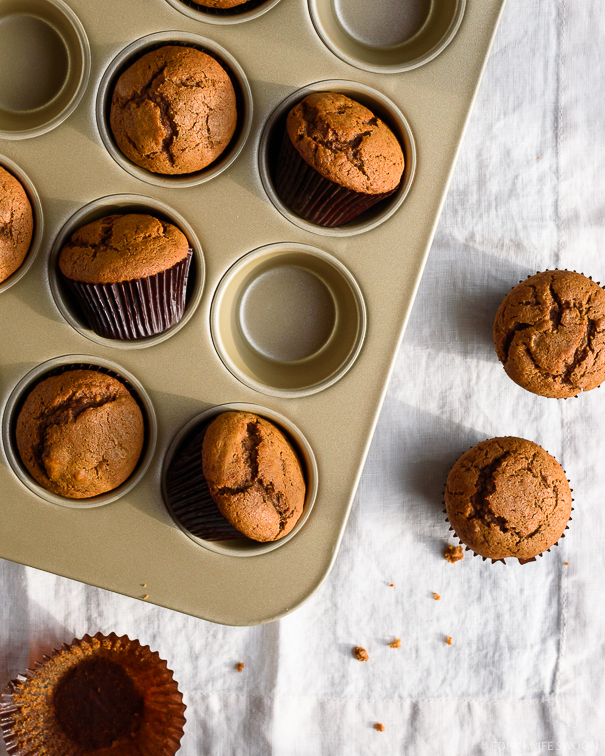 This gingerbread muffin recipe starts out loosely-based on my one-bowl dark chocolate banana muffins, but deviates a bit, incorporating deeply-flavored molasses and loads of cinnamon and ginger in lieu of the cocoa. The result is a moist, flavorful muffin that beams with holiday spice, a hint of orange, and makes a hearty winter breakfast treat. I didn’t here, but I think you could also add some chocolate chips to the batter to make the mix that much more excessive and fabulous. Or, you can drench the muffin tops in a maple glaze – akin to a baked gingerbread doughnut – for an even more indulgent sweet. In a large mixing bowl, use the back of a fork to mash the banana together with the egg until completely combined and only small lumps remain. Use a spatula to stir in the vanilla, orange zest, spices and salt. Add the oil, molasses and milk, stirring until completely combined between each addition. Add the sugars and stir to combine. Add the baking powder and baking soda and stir to combine. Fold in the flour until just mixed. Do not overbeat. 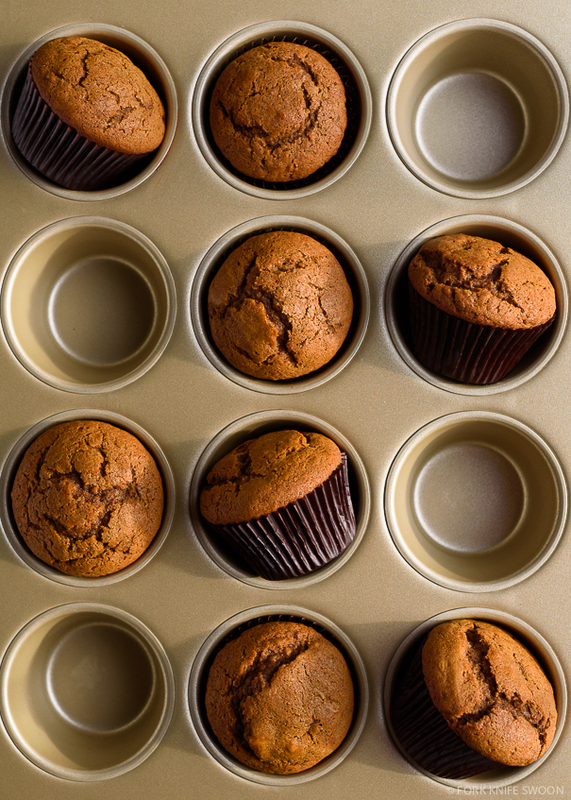 Use a cookie scoop to divide the batter evenly between the muffin cups, about 3/4 full. 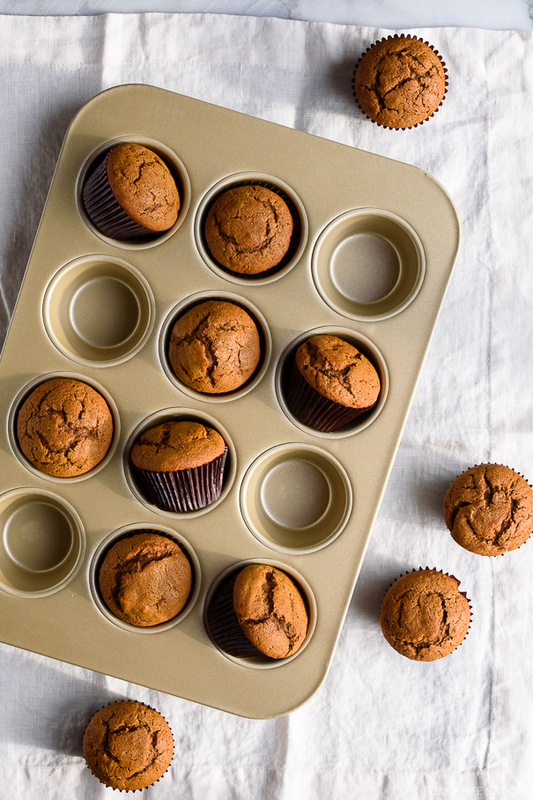 Bake for 10 minutes at 400 degrees F. Turn the oven temperature down to 375 degrees F., turn the muffin pan around, and bake for an additional 7-9 minutes until the muffin tops are set and a cake tester inserted into the center of the muffins comes out clean. 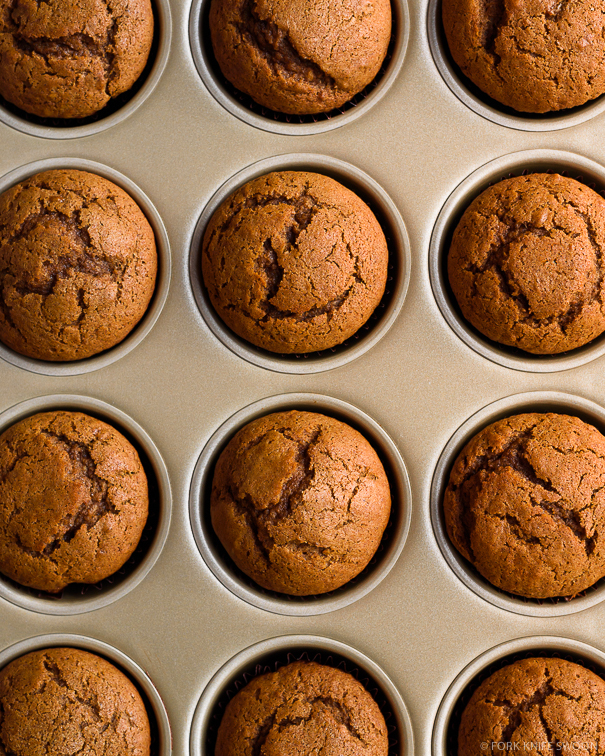 Let cool in the muffin tins for 5 minutes, then transfer to a baking rack to cool completely. Serve warm or at room-temperature. In a small bowl, stir together the powdered sugar and milk until the glaze is smooth and creamy. Add more or less milk to create a thicker/thinner consistency if preferred. Stir in the maple syrup and vanilla. 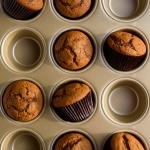 If Glazing: While the muffins are still warm, dip the tops of each in the glaze, then place on a baking rack to cool/harden. 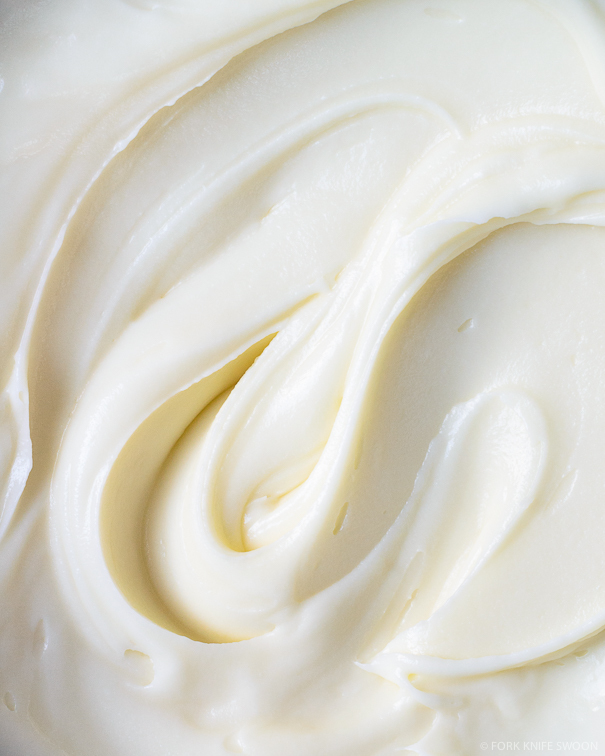 If Frosting: Wait for the muffins to fully cool, then use a knife or small offset spatula to spread on frosting. I have banana allergy, can i substitute eggs for banana? I know that 1/4 cup banana = 1 egg. Or will it give a different result? I droped a whole sentence, silly me. *i have a cousin who’s allergic to bananas… and we don’t have applesauce where i come from”. 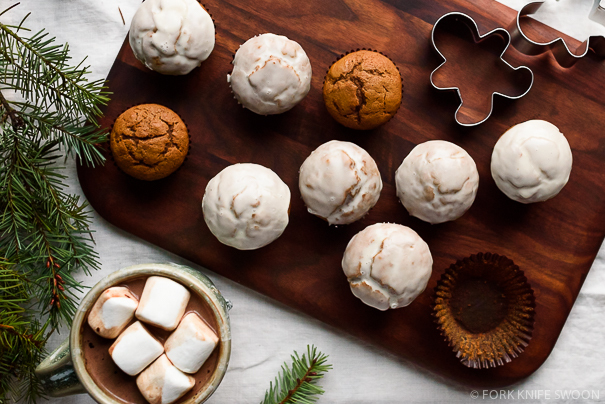 Perfect gingerbread muffins! Its Christmas time and I was looking for a good gingerbread recipe that would be easy to make a few batches of and delicious enough to gift. I added about a cup of chopped fresh cranberries, doubled the spices and zest. They are so festive. This is a great base recipe and would probably be great with nuts, chocolate chips, coconut etc. Do you think if I added a few tablespoons of Grand Marnier it would throw off the consistency or bake time much? Just made these, very good! Next time I may decrease the sugar and skip the glaze to make them a breakfast muffin. Very tasty! Thank you for the recipe! I made these into mini-muffins and they were fantastic!! They tasted and smelled incredible! Definitely will be making them again!! I have a quick question. I have someone in my family who’s very allergic to bananas. I was wondering if there’s anything I can substitute for that? My special needs students made this recipe as a cooking lesson and the muffins were a huge hit! The students loved smelling the different spices and vanilla. They all took turns “zesting” the orange. They ate them for snack and wanted more. This recipe goes into our classroom cookbook to be made again. Oh my gosh, I love that! Thank you so much for sharing that with me 🙂 Happy to hear the muffins were a hit with the kids. I am not a gingerbread fan, but my husband and sister (home recuperating from a broken ankle) are, and I will make these for them. I was sorry to read about “Ollie”. We had an almost 16 year old Cocker Spaniel that we adored. In her later days, she became deaf and almost completely blind. We took her in the car (something she once loved) to our favorite beach, and she just wasn’t happy. Her last night, I learned over and kissed her and in turn, she turned to me and split my lip open (my fault, I didn’t warn her by touching her first). But it didn’t matter to me, because we knew we had to take her to the vet the next morning. Saying goodbye to our girl, was quite possibly the hardest thing we had to do, but the best thing for her, since she just didn’t enjoy life, anymore. Of course we stayed and talked to her, until there was nothing else to say. The vet came in to administer the medication to help her sleep and I held her until it was over. My husband and I cried all the way home and it was tough but the best thing for our Molly. It took us a few years and now we have a white 11 pound Yorkie that holds our heart. We are lucky to be pooch parents and I know you feel that way too. I have pinned a few of your recipes. They all sound so good. Thank you for sharing your recipes. You have a wonderful gift! Just made these for the first time. It is now my go to recipe for ginger bread! Oh, that makes me so happy. Thanks, William!! Thank you for the recepie, i couldn’t follow it extacly because here in Uruguay i was not able to find molases, i end up using honey, and let me tell you everyone in my house loved them! I brought these muffins to my work Christmas party and they were a hit with both my co-workers and their picky kids! I omitted the orange zest and the glaze and they were still delicious. Thanks for the recipe!